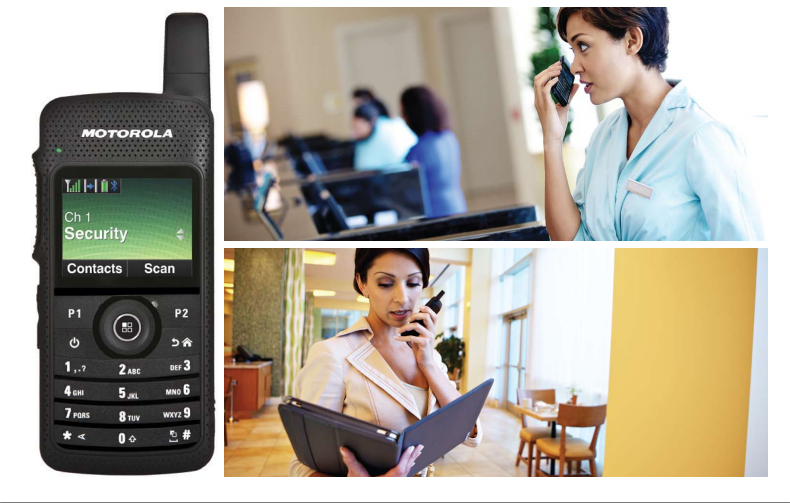 Digital has never looked better From the concierge desk to the convention centre, MOTOTRBO™ SL Series keeps you instantly connected and in control with an incredibly sleek and light radio for the ultimate in discreet communication. Versatile and powerful, our revolutionary MOTOTRBO portable combines the best of two-way radio functionality with the latest digital technology. 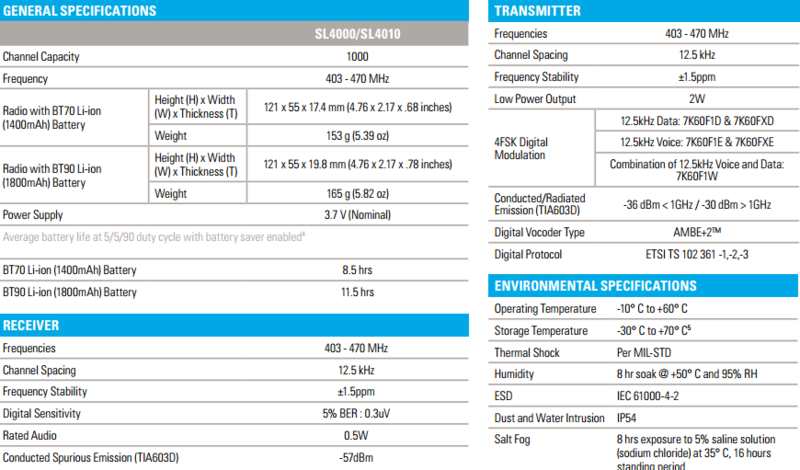 SL Series radios integrate voice and data seamlessly, offer enhanced features that are easy to use, such as integrated Bluetooth®, covert mode, vibrate alert and Intelligent Audio. Designed in a small form factor so sophisticated, it is like no other radio you have used. Only the SL Series enhances your professionalism, so you can remaster your productivity and image like never before. 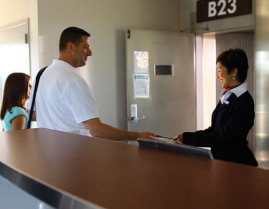 INTEGRATED DATA SOLUTIONS - Whether the front desk is assisting a guest or the event planner is preparing for a special event, sharing information instantly is paramount. The SL Series features text messaging and embedded Bluetooth® data in the radio so work teams can share real time information, saving valuable hours and enabling better decision making. Plus your staff can read work order tickets and text messages quickly and clearly on the large, high resolution, full-colour screen. Take a look at the enhanced work order ticket management in the SL Series and see what true efficiency can be. We’ve eliminated a number of steps to read work order tickets and the five line display presents data at a glance–saving time and eliminating scrolling through screens. And Motorola’s Application Developer Program offers customised data applications tailored to your operations. With the largest developer program in the industry, data applications help meet your objectives – from email gateways to telephony integration, and more. COVERT WHEN IT COUNTS - Put the SL Series radio in covert mode and it goes dark – shielding the display, LED lights and audible tones –for the ultimate in discretion. Your security personnel can hear clearly using our inconspicuous audio accessories, but no one else can. These accessories – a swivel earpiece or surveillance earpiece with a translucent tube – are so small, sleek and powerful, your staff can converse privately and conveniently wherever they work. For further discretion, they can use the vibrate alert feature to switch the radio to vibrate mode and never disturb or interrupt guests again. EXCEPTIONALLY INTUITIVE - The high resolution, full colour screen on the SL Series portable automatically senses ambient light and adjusts backlighting for optimal viewing in all kinds of conditions. It also features a full keypad and an enhanced programmable button that manages up to nine frequently used features. Press a button and access all of your contacts or check the status of a work ticket with just a touch. Customisable voice announcement provides audible confirmation so a user can be notified of channel and zone changes or programmable button statuses without having to view the radio display. EXPANDED CAPACITY AND COVERAGE - Your personnel are on the move –throughout your buildings and across your properties. That’s why you need the far-reaching performance of MOTOTRBO. The IP Site Connect solution dramatically improves customer service and productivity by using the Internet to extend coverage to create a wide area network, enhance single site coverage or link geographically dispersed locations. Capacity Plus provides singlesite trunking, expanding capacity to over 1,000 users. Combining the benefits of both solutions, Linked Capacity Plus is an entry-level, multi-site trunking solution that expands capacity and extends coverage so large work teams can stay connected across a wide area. So whether you want expanded coverage at a single site or across multiple ones, MOTOTRBO can be scaled to meet your voice and data communication needs. 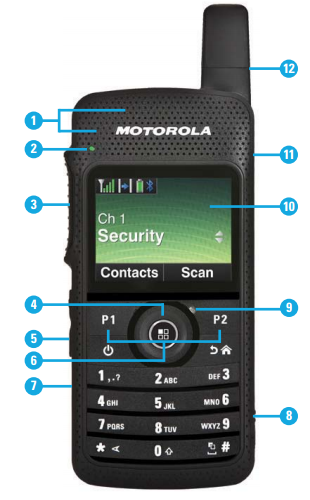 REMARKABLY RELIABLE - MOTOTRBO meets the most demanding specs, including IP54 for dust and water protection and U.S. Military Standard 810 C, D, E, F and G. For further peace of mind, it’s even backed by a two-year manufacturer’s warranty as standard1 . COMPREHENSIVE SERVICE AND SUPPORT - No matter what help your business might need, we have a service that delivers. We can provide assistance at every stage of the solutions lifecycle, from initial planning, through to solution integration and ongoing support. Managing in-house repairs and maintenance of your radios takes a dedicated staff of technicians and an ongoing investment in diagnostic equipment, repair tools and technical training to keep up to speed on the latest technology. We’ve made that investment for you so you can easily and cost-effectively keep radios in top operating condition. With Service from the Start with Comprehensive Coverage2 , you can protect your MOTOTRBO SL radios against accidental damage, normal wear and tear, and more. This unique offering comprises fast turnaround times, expert telephone technical support and access to the latest software releases3 ; all backed by Motorola’s global infrastructure, highly qualified support technicians and certified repair facilities. You’ll get multi-year technical support and repair coverage, eliminating ‘surprise’ repair costs and providing the investment protection you need to reduce your total cost of ownership. Enhanced Peace of Mind - Despite the robust design of the SL Series, we recognise that accidents happen. In addition to normal wear and tear, Service from the Start includes Comprehensive Coverage to protect you from accidental breakage so you can enjoy enhanced peace of mind. No matter what is damaged, from broken displays and cracked housing to other internal and external components, the repair is covered. ENHANCE MOBILITY WITH INTEGRATED BLUETOOTH - Whether hotel staff are responding to guest requests or a security team is covering a special event, sharing information instantly, easily and seamlessly is critical to your business. 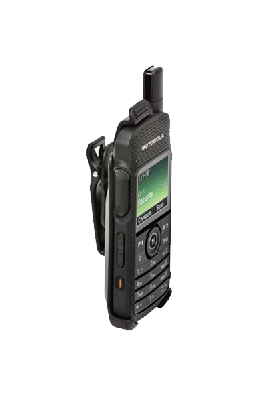 So we embedded Bluetooth® audio in our MOTOTRBO radios to make communications even more convenient. Our exclusive Operations Critical Wireless earpiece handles loud environments while an optional wireless push-to-talk (PTT) button links to any earpiece to enable more discreet communications. Just put the PTT in a pocket or on a lapel and connect instantly. MOVE FROM HECTIC TO HUSHED - Our SL Series radios offer a smart feature–Intelligent Audio–that adjusts radio volume to fit the environment’s noise level. Intelligent Audio also works with select audio accessories, giving your workforce even more communication flexibility. Connect an SL Series accessory and the Intelligent Audio feature automatically adjusts radio volume and filters out background noise, drastically improving audio clarity. Now your employees won’t miss a call at a bustling banquet or disturb others when they move into a quiet hallway. TALK COMFORTABLY AND COVERTLY - Our single-wire swivel earpiece and surveillance earpiece are small, sleek and powerful, so your employees can communicate easily wherever they walk and talk. The transparent coiled cord and rubber earbud on the surveillance earpiece offers greater discreetness for security personnel. The flexible-fitting swivel earpiece is comfortable, even for extended shifts. Both earpieces have an in-line microphone and push-to-talk, making communication easier and unobtrusive. Add compact carrying accessories – like a swivel carry holder or a lightweight wrist strap – and you’ve got flexibility and comfort that meets the needs of the busiest people on your team. THIN IS IN - FROM BATTERIES TO CHARGERS - From the standard cell phone-sized batteries to the microUSB charger, we designed our SL Series accessories with portability, professionalism and convenience as our top priorities. Both the standard and high-capacity batteries are so slim and lightweight that it’s easy to carry spares. Our unique multi-unit charger merges high power with high image, allowing you to charge up to six radios or batteries simultaneously. This charger is both functional and sleek in design.